Feed is a major portion of the total costs involved in Missouri swine production. Interest in on-farm ration formulation and mixing is growing, particularly in years of short feed supplies and high prices. If producers are willing to learn the nutrient requirements for various weights and classes of hogs and to apply information available on nutrient levels in feeds, they can formulate and mix swine rations that will result in performance comparable with those commercially available. On-farm mixing is not for all producers. It does demand accuracy, attention to detail, additional equipment in some cases, and a good job of mixing. Supplying vitamins has been a problem for those interested in on-farm ration formulation in some areas of Missouri. Several vitamin sources are available to producers. These vary rather widely in price, number of vitamins contained, concentration of vitamins in the mix, and other nutrients or additives present. There are many variations, but vitamin supplementation in broad terms is available to Missouri producers in three forms. These might be called: complete supplements, mineral-vitamin premixes and vitamin premixes. These commonly include all nutrients required other than the energy source or grain. They should include protein, major minerals, trace minerals, vitamins, and antibiotics or other drug ingredients. In most cases, these supplements do a good job of meeting vitamin requirements if purchased from reliable companies and fed according to recommendations. Disadvantages may be in less flexibility in purchasing ingredients of protein, calcium, phosphorus and antibiotics. In general, prices will be higher in this form than where the producer purchases and mixes these ingredients separately. However, many times there is some service included in addition to feedstuffs. Protein, calcium and phosphorus levels in the complete ration should be checked using company recommendations and average figures on these nutrients and in the grain you are feeding. In most cases it is not possible to evaluate vitamin and trace mineral levels since they usually are not listed by amounts on the company’s feed tag. The producer assumes that amounts of these nutrients are adequate. His evaluation of a particular company’s feed then is based primarily on price and past experience with his pigs’ performance using their supplement. Particular attention should be paid to kinds and amounts of antibiotics present in evaluating commercial supplements. Many times this is the major difference in cost between the products of two companies. Feed tags must list actual amounts of antibiotics in the supplement. Be sure to evaluate antibiotics and other drug ingredients on amounts per ton of complete mixed feed, taking into consideration additive concentration in the supplement and the company’s recommendations on amounts to add per ton of complete feed. Commercial mineral-vitamin premixes have some of the same limitations as complete supplements for producers set up to do their own ration mixing. The major minerals of calcium, phosphorus and salt are nearly always included, and trace minerals are often included as well. Mineral-vitamin premixes permit the swine producer to purchase protein needs separately. They may or may not be medicated. They may or may not include on the tag actual amounts of vitamins present. Where actual ingredient amounts are not listed, the producer again must depend on the reliability of the company, past experience with this product, and the current cost compared to other sources. Where vitamins are listed and concentrations given, an evaluation of amounts present can be checked against the requirements of the pig to see if requirements are met. This source of supplementation generally is a slightly more expensive way to provide vitamins, and it is considerably more expensive to provide calcium and phosphorus compared to actual ingredient costs bought and mixed. Again, some of the detail of formulating and mixing these ingredients has been done for the producer and this may have some value. Several companies market vitamin premixes in Missouri. The most common variations in these are in concentrations, amounts recommended to mix per ton of feed, levels of antibiotics or medications present, and price. The cost that vitamins add to a ton of swine feed can vary significantly depending on these variations. In a series of least-cost computer ration formulation meetings conducted by MU researchers, the addition of vitamins from commercial companies varied from $2 to more than $10 per ton of complete mixed feed. 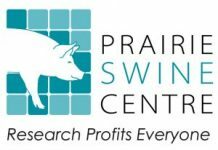 The basic goal of producers should be to meet the vitamin requirements of different weights and classes of swine. This is essential for top production. The second goal, of course, is to meet these needs as economically as possible. Table 1 lists the Missouri recommended vitamin additions per ton of complete feed. These suggested figures are adapted from the 1988 National Research Council’s recommended nutrient requirements for swine, which equal or exceed these requirement figures. Because of the variability of vitamins in natural swine feedstuffs and the relatively low cost of commercial vitamins, it is recommended that producers provide the following vitamins completely from the vitamin premix and disregard amounts in the feed. These are vitamin A, D, E, K, riboflavin, niacin, pantothenic acid, choline and B12. Thiamin and vitamin B6 requirements should be met in adequate amounts in normal swine feeds. With these requirements in mind, the first step in deciding which vitamin supplement to buy is to select a reliable company. Second, carefully study the feed tag. Third, determine ingredients present other than vitamins and determine their value to you. Fourth, check vitamin levels using the vitamin supplement check sheet in Table 3 to determine if requirements are met. Fifth, compare price. Most vitamin premixes contain a list of vitamins present and units of each vitamin per pound of premix. They then recommend how many pounds of premix to mix in a ton of complete feed. A simple way to see if your premix meets the vitamin requirements of the pig is to check vitamin levels on a ton of complete feed basis. Follow the example in Tables 2 and 3. 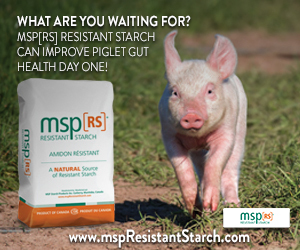 If you are offered the grower premix in Table 2, will it meet the needs of 60-pound pigs? Looking down the list, find on the premix tag that there are 600,000 units of vitamin A per pound of premix. This is entered under “Units per pound of premix,” column 2, Table 3. Multiplying units per pound by pounds premix per ton gives the total units per ton for vitamin A of 4,800,000 IU This figure is in column 4, Table 3. This more than meets recommendation for finishing hogs. If one gives credit for some vitamin A in feedstuffs, it probably will be adequate for growers and breeders. Using the same procedures with other vitamins in Table 3, one would conclude this vitamin source is at best borderline in assuring adequate vitamins from this source only. Producers can consider adding a higher level of this vitamin supplement or look for one with a higher concentration of vitamins per pound. Once you are satisfied that vitamin levels are adequate, consider the other nutrients in the premix that have been mentioned. You need to have some idea of their value on a ton of feed basis. Table 4 provides a worksheet designed for quickly checking vitamin sources to see if they meet Missouri recommendations.